Thailand is a collage of animated sceneries with so much diversity that you won’t find anywhere in the world. There are world-class places to visit in Thailand crowded with over the top party scenes and shopping centres. You’ll see Buddhist temples as well as beautiful Hindu temples and mosques. There are hill tribes who dwell in the lush landscapes. There are traditional Agro and fishing communities along with ancient ruins and majestic coastlines filled with gorgeous beaches and sun-kissed islands. Thailand Tourism has promoted this beautiful country for travellers from every walk of life. So many enthralling perspectives explain why Thailand is considered Southeast Asia’s most popular travel destination. Here is an overview of the best places to visit in Thailand which showcases the important cultural, historic and natural attractions of the country. Here is the thing. The only trouble with planning a trip to Thailand is finalizing the list of places of interest you want to visit. Moreover, there are so many Thailand tour packages that offer a multitude of places and activities that it leaves many of us confused. But you don’t have to worry because we have already created the ultimate list for you. Based on different categories, we have done some detailed research and picked some of the best places to visit in Thailand. So Get Ready To Spend Your Holidays In Thailand!!! Thailand is filled with hundreds of islands. These tiny landmasses are scattered all around the country. These islands are known to have soft sandy beaches, unique flora, fauna and marine life. Some of these islands are also popular for adventure sports like scuba diving, snorkelling, cliff jumping and jet ski rides. The islands of Thailand have an array of stay options ranging from luxury resorts to cheap stay homes. 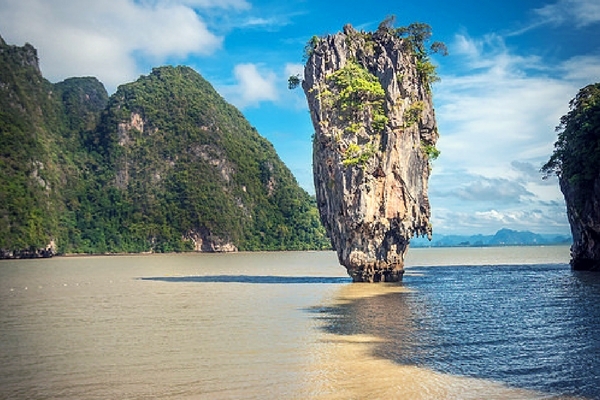 Here is a list of some of the best islands that you can explore during your trip to Thailand. It is a small archipelago in the Krabi Province in Southern Thailand. Ko Phi Phi Don is the largest island of the group and is the only island with permanent inhabitants. 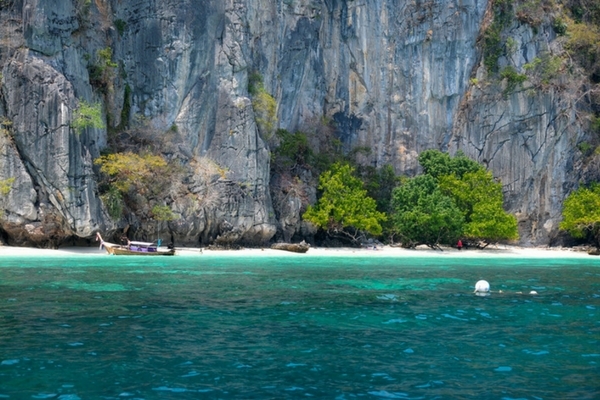 The smaller Ko Phi Phi Leh is famous as the filming location for the 2000 movie “The Beach”. The island is filled with luxury retreats which provide stunning views of the island. 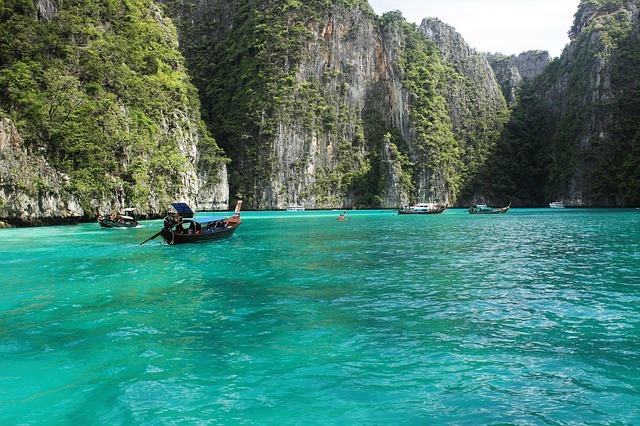 Ko Phi Phi is promoted by Thailand Tourism because of umpteen reasons. Koh Phi Phi is the perfect escape for the young crowd who want to party and indulge in adventure sports like snorkelling, diving and cliff jumping. A boat ride to the beautiful island of Koh Phi Phi Leh is one of the perfect leisure activities at this island. During The New Years, Koh Phi Phi Islands hosts one of the most extravagant parties in Thailand with thousands of tourists flocking here to have a time of their life. This destination has been a hotspot for the adventure lovers who come to this island to experience the best of underwater sports. The quaint atmosphere of this island makes the visit an amazing experience. In fact, Koh Tao is known as one of the best diving spots in the world and that’s why it is so popular between the adrenaline junkies all over the globe. Apart from scuba diving, one can also enjoy rock climbing and hikers around the different parts of the island. When it comes to the best islands of Thailand, Koh Tao is one of the best places to visit in Thailand. This island has a world-renowned diving school where 7000 new divers get certified every year. The island also invites fishing enthusiasts who arrive here hoping to catch the abundant marlin, crabs, lobsters, snapper or barracuda. For those who are not interested in adventure or fishing activities can spend their time at the little sandy coves, pretty lantern-lit restaurants – and craft beer pubs. The full moon parties of Koh Tao are more private and less crowded compared to other destinations of Thailand. It is located near the border with Thailand and Cambodia. 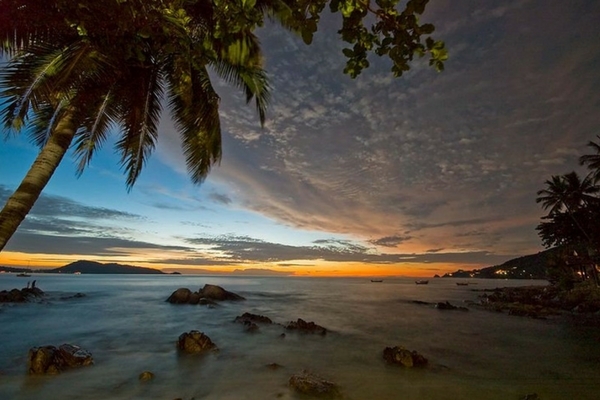 Ko Chang is counted among the most beautiful and ecologically diverse places to visit in Thailand. This third largest island of Thailand is also the biggest in the Ko Chang Marine Park archipelago. Unlike most of the beaches of the country, Ko Chang is a mountainous island and is filled with cascading waterfalls, colourful coral reefs, encompassing hillocks, lush green rainforests and long white beaches. Ko Chang’s majority of the landmass is a part of The National Park which makes it a great place to indulge in some jungle trekking. Photographers and wildlife enthusiasts come here from all around the world to study the flora, fauna, marine life and avifauna found here. This island is also a major hub for those who want to cross the international border and mix their Thailand vacation with a quick trip to Siam Reap, Cambodia. A Thai province, Phuket’s main city is also called Phuket. It is a large island province and is filled with several islands located in the western coast of the country. Also filled with scenic beaches which feature various luxury resorts, private beach bungalows and traditional accommodations for visitors. These beaches are filled with stylish nightclubs and shopping centres. For those who want to spend their time with leisure can also visit golf courses, historical museums, and monuments. Phuket is the luxury vacation seeker’s paradise. Travelers come here because of the classy retreats and the best nightlife in South East Asia. Phuket is also a destination of choice for business travellers, corporate groups and those who are looking to find an ideal venue for their bachelor’s or bachelorette parties. The bustling streets of Phuket are ongoing with life 24×7 and the party never ends here. The travellers looking for some pampering can also spend their time at the spa resorts situated around the many beaches. Ko Phangan a pristine island situated in the Gulf of Thailand. This beautiful island resort is located halfway between Ko Samui and Ko Tao. The island is famous between the backpacking communities coming here from different parts of the world to experience the island’s beauty. A large part of Ko Phangan is filled with rainforests and hillocks that make amazing hiking destinations for the adventure lovers. Every year the island holds an electronic dance festival known as the Full Moon Party which invites revelers from all around the world. As one of the most popular beaches in Thailand, it is the hotspot for the party dwellers. During the New Year, this island hosts more than 20,000 tourists, dancing, drinking and frolicking on the beach. Apart from the famous full moon parties, the island also hosts the half moon and black moon parties. The beach’s cocktail bars are popular for the lovely drinks and food menu that you won’t find anywhere else. 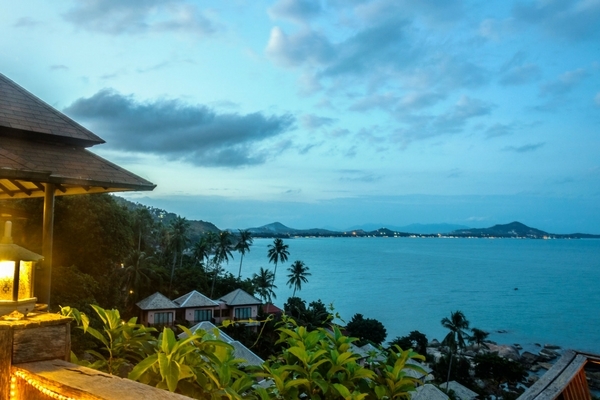 Ko Samui is one of the most culturally rich islands of Thailand. This destination is loved by the photographers and writers who come here to take part in the festivals hosted here. Some of the most popular festivals of Ko Samui are the Buffalo Fighting Festival, the Ten Stars Samui Art Party, and several street fairs. These festivals are vibrant with vendors selling local delicacies, clothing, and souvenirs. The yearly Samui Regatta invites the sailors and watersport enthusiast from all around the world. Samui Regatta hosts the world famous triathlon event that invites more than 500 competitors from 22 countries. Ko Samui is one of the most backpacker and budget-friendly destinations of Thailand. Known for cheap hut stays and vibrant hostels, you can indulge in a full moon party during your vacation here. Located at a distance of an hour from Krabi, Koh Lanta is a small archipelago with beautiful beaches hosting some of the most quaint resorts in the country. 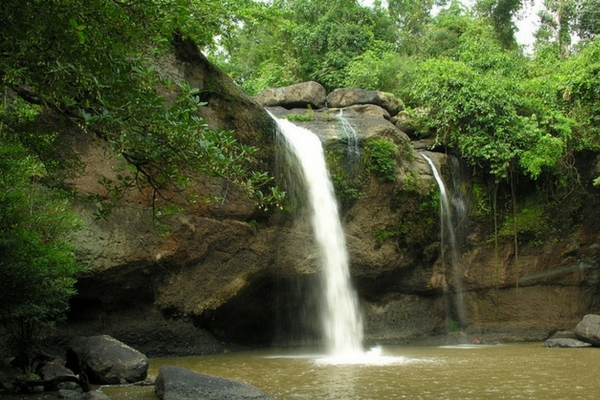 Koh Lanta has beautiful nature reserves filled with cascading waterfalls and pristine lakes. The rich flora and fauna makes up for the fact that you will hardly see any other human being during your trip. Koh Lanta is known for its family-friendly vibe and you will meet a lot of travelers in their 40s coming here with their children. This island is also famous for its world-class massage parlors. If your idea of a vacation is to rejuvenate yourself then this is where you should be. Ko Lipe is the part of 51 islands that make up for the Tarutao National Marine Park. 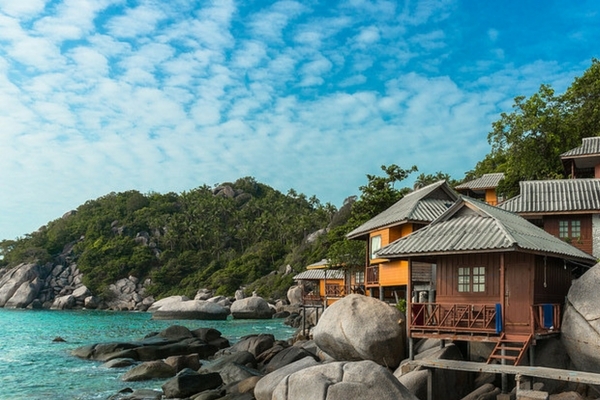 Ko Lipe is popular between honeymooners because of its seclusion. Because of the privacy, it attracts many newlyweds who come here to enjoy this remote location with safe, friendly environment. This is one of the smallest islands in Thailand and its proximity is enough to be explored on the foot. Diving, Snorkeling and short boat rides to nearby islands are some of the popular activities here. Those who are looking to shake a leg can also head to The Pattaya Beach to indulge in the nightlife and party scene. Similan Islands are a series of nine islands with the quaintest surroundings. 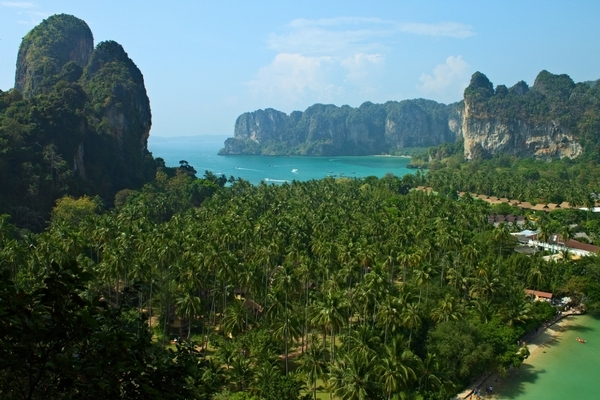 The series of islands form a National Park overlooking the gorgeous Andaman Sea. The turquoise waters and the warm beaches make these islands a perfect place for diving and snorkeling among the magnificent coral reefs. The Islands here are categorized in the numbers. Among these islands, the beaches of Koh Miang are the most beautiful. This beach is highly preferred among the couples who want to spend some time in the traditional bamboo bungalows. Koh Tachai Island is known for its pink sunset and sparkling sandy beaches. Richelieu Rock is one of the hotspots for the marine life enthusiasts who come here to spot the Great Whale Sharks. 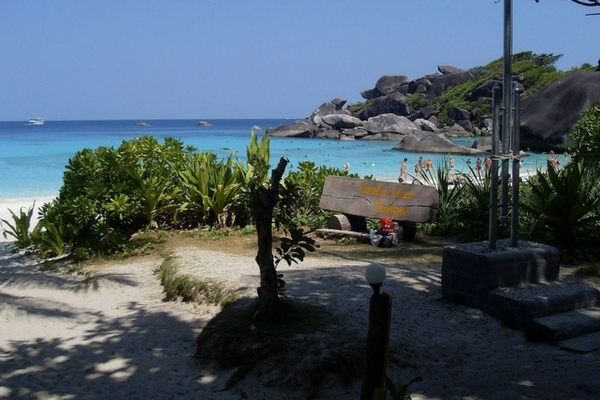 The Similan Islands are closed for tourists between May and October. Ko Si Chang is the perfect beach for those who are looking for an idyllic vacation experience especially if they have less time in their hand. Ko Si Chang is not to be confused with Ko Chang. This island can be accessed via a short boat ride from Bangkok which makes it a perfect beach destination mostly popular between the locals. Ko Si Chang is one of the most beautiful places to visit in Thailand and around Bangkok. 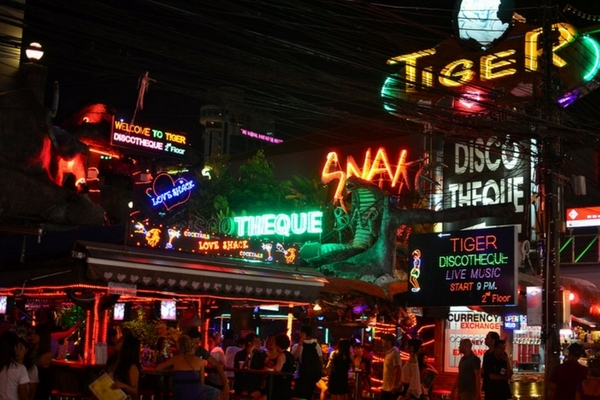 Nightlife in Thailand entirely deserves its international reputation. Thailand Tourism highly promotes the party scenes of the country and attracts a large crowd from every corner of the world. If you are someone seeking endless fun, want to dance among strangers and have some fine craft beer then Thailand is where you should be. The nightlife of Thailand exists in the form of parties in the hidden corners of the towns as well as on the beaches. You can go to rooftop bars, pubs, gogo bars, breweries, enjoy shows of live rock bands, international DJs and artists from all around the world. The cabaret shows, pool parties, full moon parties are what make the nightlife an enthralling and memorable experience. 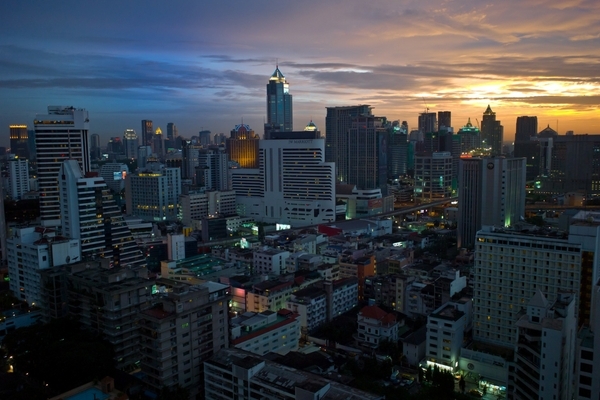 Sukhumvit is situated at a short distance from Siam. 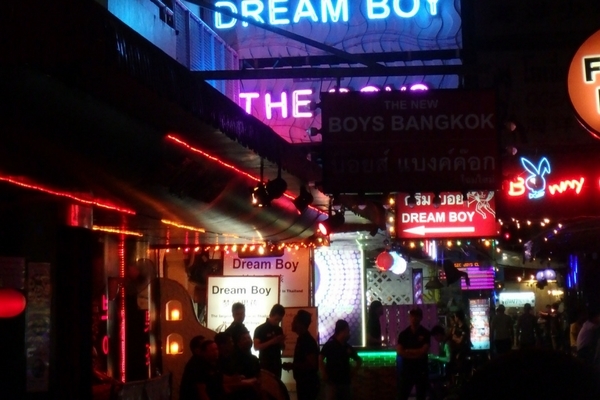 For the tourists in Bangkok, Sukhumvit serves as one of the most prominent nightlife areas. This area covers a large part of Bangkok which is further divided into several smaller sub-areas. One can access this party town via Tu-Tuks or through the Sukhumvit BTS Skytrain line. Nana: Nana is one of three redlight districts of Bangkok. The street is filled with many beer bars and go go bars. Nana is the destination for the cheapest cocktails and craft beer in Bangkok. You will see many groups of travelers and backpackers flocking around Nana Plaza in night exploring the countless bars and entertainment centers. Phrom Phong: Phrom Phong’s lifestyle and the vibe is influenced from the party districts of Tokyo, Japan. One of the prime attractions here are the Japanese Karaoke Bars that serve delicious sushi and sea food along with live music and DJ performances. Apart from the Japanese bars, you can also find many family and couple friendly international restaurants here. Thong Lor: Thong Lor is more of an upmarket area known for its classy bars and restaurants. This area is right next to Phrom Phong and is popular because of its couple friendly party venues. It is not too hard to spot a local or international celebrity here. Thong Lor is a lovely venue that hosts some of the coolest cocktail bars and restaurants in Bangkok. Apart from the regular joints and the hotspots for the revellers, one can also enjoy curated parties at the many hotels and resorts. These hotels organize DJ nights and one can find a chance to meet the world-famous music artists. Apart from dance music and parties, these resorts also serve the best dinner buffets for you to feast upon. 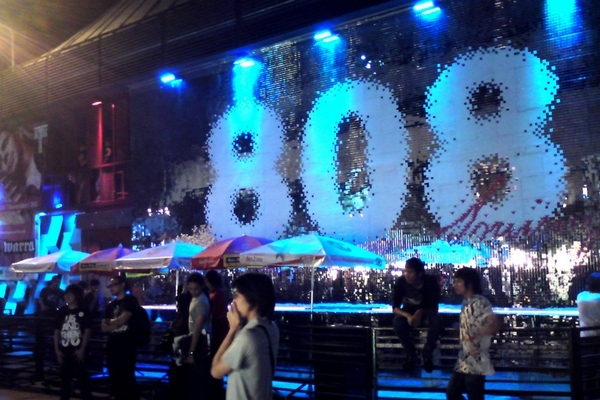 RCA or the Royal City Avenue is the prime party venues of Bangkok city. Bangkok’s largest nightlife area is filled with high class chic pubs and lounges. This is one of the most bustling streetsides of the Thai Capital and has a very couple friendly vibe attached to it. The streets of RCA are known to start getting crowded with revelers the moment the clock strikes seven. Some of the most prominent clubs like Route 66 and Slim have parties ongoing till morning and are packed with female travelers, couples and honeymooners. When you are exploring the RCA, trying the local Thai whiskey will get your senses tantalizing. For those who are looking for a less crowded joint to experience Thailand’s nightlife can also walk over to Cosmic Café and LED for dance music and craft beer that goes on all night long. Soi Bangla Road’s activity begins after the sun goes down. During the day hours, you won’t even realize that Soi Bangla is a party hot spot. As the evening falls roads around this area is closed for vehicle entry. The traffic vanishes and this patch of street in the center of Phuket becomes a 400 meter festival of neon lights, thumping music and cheap beer. Phuket is known as a popular destination for the young crowd who are come here to celebrate their friend’s bachelors or bachelorette parties. Soi Bangla Road comprises of the best of the fun night out in Phuket. The bars of Soi Bangla have their own breweries and are the best place to indulge in some Thai beer. These pubs and bars have outdoor seating and have a great view of the party region with their open-fronted seating. Filled with trapeze artists, hundred marching elephants, and a multitude of other animals performing as a part of storytelling session makes for the perfect venue for those who want to spend their time away from the loud music and thumping beats. 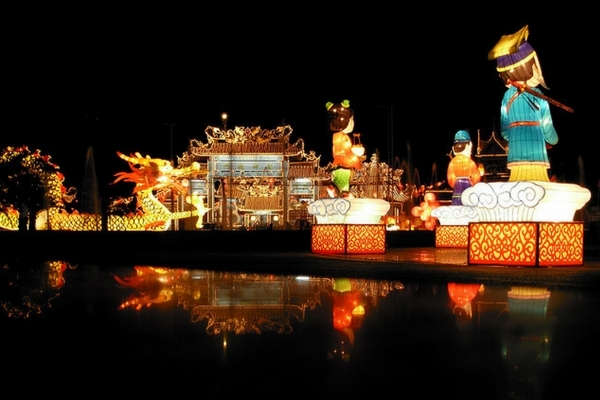 Phuket FantaSea boasts itself as the ultimate cultural park and is a host of an extravagant carnival starting every night. This place will introduce you with the unique culture of Thailand. The big, bright and ornate atmosphere of this FantaSea makes for the perfect venue to spend your time with your loved one. Phuket FantaSea is also popular for hosting one of the biggest buffets in Asia. The Golden Kinnaree Buffet Restaurant’s elegant interiors can host 4,000 visitors at the same time. With two long buffet counters, you can enjoy an array of local and international cuisine. Apart from the scrumptious offerings from the specially curated menu, you can also find specialized kiosks serving special dishes presented as the speciality of the day. Among the multitude of entertainment venues, the Similan Adventure Centre is especially designed for the kids. With sea – themed arcade games, this place make sure that the FantaSea provides a fun time for every member of the family. Patong is located in southern Thailand and is known as the center of nightlife. Among the most happening places to visit in Thailand, Patong has a charm of its own. The night parties and live-mix DJ music pulls the revelers from all around the world to have a time of their life. Patong is a very small town but the vibrant atmosphere gives the visitors ample amount of choices to select from. The pubs and bars of the town are known for the fine selection of music and their playlist ranges from for folk, heavy rock, house and hip-hop. Patong Beach is also known as a live entertainment center. The beach hosts a number of street performers who can be seen fire spitting, freestyle dancing, juggling and singing. Phuket’s annual Gay Festival held in Patong is a kaleidoscope of colours. This festival is a fun a riot filled with floats and parades. The secluded beach in Patong is a host of colourful demonstrations filed with an energizing vibe. The colourful, eccentric, outrageous and fun filled extravaganza of this festival invites people of ‘alternative’ sexualities to be a part of the event. The Gay Festival attracts revelers from the world. The never ending parties, food festivals and barbecue sessions make this event a must visit. You can attend the parade hosted by the pride community who show up wearing the over-the-top costumes. With gay-friendly hotels and resorts, the festival has a unique flavor for those who wish to experience the best of Patong Beach. DJ Station Bangkok is Asia’s finest nighclubs and one of the coolest dance clubs in the world. DJ station is also known for its vibrant atmosphere as it is one of the largest gay clubs in the world. DJ station is a paradise for the music lovers who flock here at least once during their trip to tap their feet on the amazing music. The club is divided in three sections with each having its own music platform and specialized food and drinks menu. DJ Station is a lovely place to be where everyone, irrespective of their gender and sexuality are welcomed. Cha Weng is counted as one of the best places to visit in Thailand for those who love partying and enjoying delicious food at the same time. 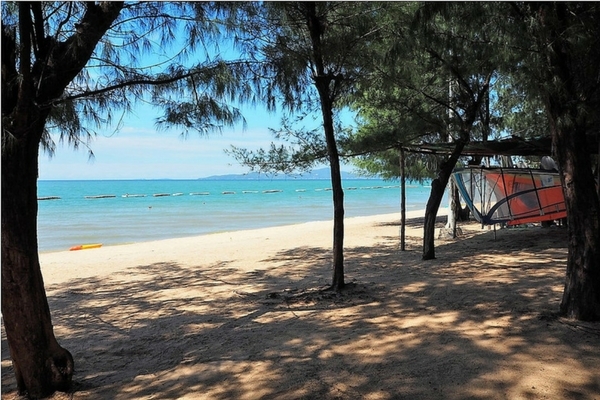 If your idea of a party friendly destination also involves exploring the culinary culture of the country then Cha Weng beach is where you should be. The night markets surrounding this beach never shut down and one can experience the best of international delicacies at the European style pubs and bistros here. 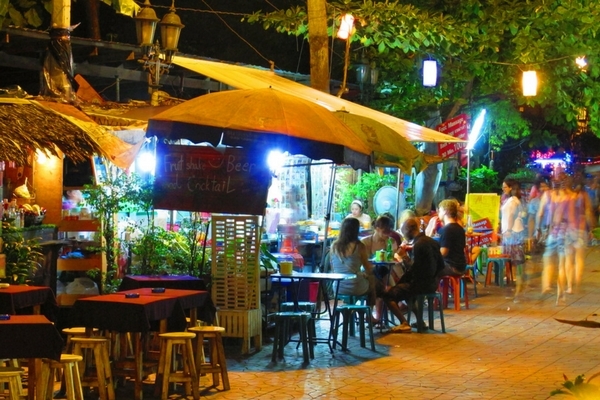 The Green Mango Soi is the hub of the nightlife at Cha Weng Beach. The late night activities here include dance clubs with upbeat hip hop and R & B tunes and the revelers can be seen dancing on the streets with a bottle of beer or a drink in their hand. One of the most popular clubs here is the Green Mango Club. Designed on the lines of the warehouse pubs of New York and Miami, this club houses two different rooms with the hip hop and techno music being played and some of the world famous DJs often come here to make an appearance. 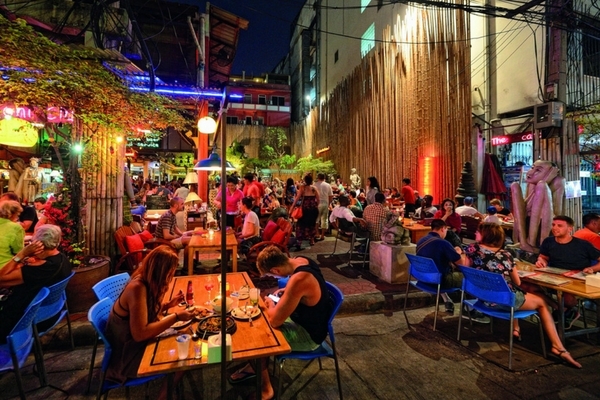 Khao San Road is a charming street side party venue in Bangkok. With neon signs filled street coming to life at 7 PM evening and loud music coming out from different corners of the street, you’ll see revelers walking, dancing and enjoying the drinks and food everywhere. From back alley Hippie Da Bar to Kerb-Side Cocktail Shack, the joints located at Khao San Road make sure that they don’t turn their visitors disappointed. You can also buy a bottle of beer from the street side shop and drink it on the road. Located in a close proximity of Khao San Road, Rambuttri presents the sight of Bangkok in a very rustic form. Filled with classy restaurants, guest houses, bars and street food stalls, Rambuttri is a family friendly destination where the eating joints are open till late night. The honeymooners and couples will find the horse shoe shaped road of Rambuttri a perfect place to indulge in a romantic candle light dinner or for clubbing. During the night, colourful paper lanterns light up the street and the bars and stalls with live food preparations come alive. A whole section of Rambuttri is dedicated to roadside stalls once the night falls. Thailand is a much frequented Honeymoon destination for the honeymooners. Couples from all across the world visit Thailand to spend the first few days of their wedding period here. The beaches, the nightlife, the clubs and the food make the holiday experience in Thailand a very romantic and personal affair. A holiday spent together in the beautiful islands of this country is bound to ignite the sparks of love between you two. Here are some of the best honeymoon destinations in Thailand for you to spend time with your loved one. As a honeymoon destination Krabi is counted among the best places to visit in Thailand among the newly married couples. Krabi is the perfect destination for those who want to experience luxury during their honeymoon. Newlyweds choose Krabi because of the amenities present here. They can go shopping, party, island hopping, scuba diving or just sit and relax on the golden sandy beaches here. Krabi has about 130 islands here. Couples here spend their time at private secluded islands enjoying a personal time among themselves with no one to disturb them. A majority of visitors club their Krabi trip with Phuket so that they can enjoy the best of both worlds on their trip. 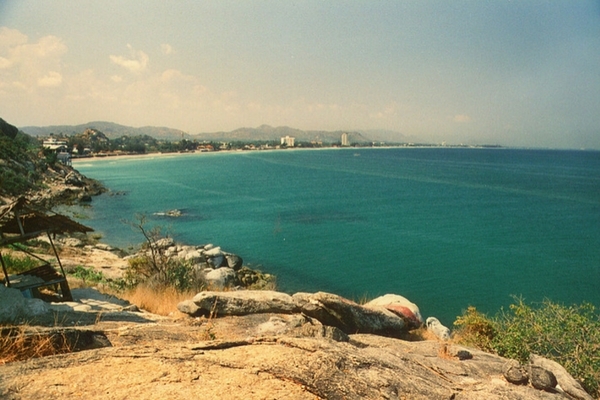 Hua Hin is one of the most laidback and private honeymoon destinations in Thailand. Filled with some of the most luxurious beach resorts, Hua Hin has properties ranging from private beach villas to traditional bamboo cottages. Most of the honeymoon based Thailand tour packages offer a luxury stay at Hua Hin for a few days. The surreal landscape of this place brings you closer to the natural ecosystem of Thailand. A day trip to Pa La-U Waterfalls is perfect to spend a day in utmost privacy with your loved one. Hua Hin is also a perfect vacation spot for the wine connoisseurs. If you two love sipping the finest of wines then you should be visiting the local vineyards. This is a more traditional part of Thailand compared to Bangkok and Phuket. Chiang Mai invites the adventurous couples who love a dash of adrenaline during their vacation. Chiang Mai has many surprises hidden in every corner. The night bazaar here is one of the lovely experiences which bring you closer to Thai Culture. The Chiang Mai cooking class is perfect for the food loving couples. Even if they are not a food connoisseur then a cooking class is still a perfect way to spend quality some time with each other. Chiang Mai has more than 300 highly revered Buddhist Temples. For those who have a love for history and beautiful architecture can take some time off and enjoy these beauties from the past. This beach is tucked in a corner of Thailand. Separate from the mainstream crowd, Monkey Beach is perfect for the honeymooners who are looking for a more special and offbeat destination. 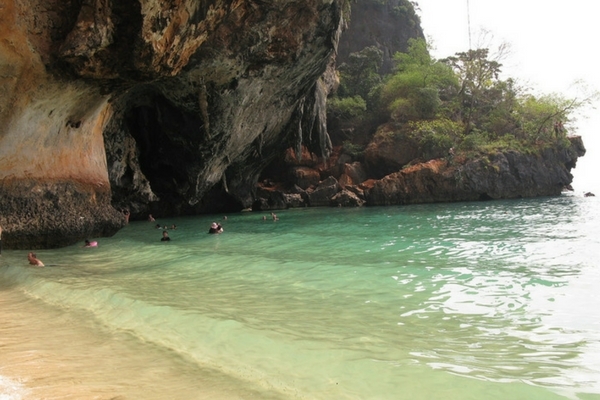 This beautiful beach is hidden in a cove of Loh Dalum Bay in the greater islands of Phi Phi Don. Monkey beach offers adventurous activities like Kayaking and snorkeling. You can also explore the hidden coves nearby and feel the grandeur of nature’s beauty bestowed here. 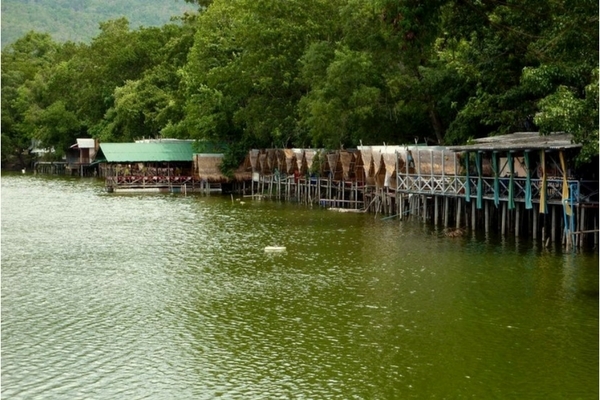 Dominated by the beautiful River Kwai, Kanchanaburi is filled with natural splendor. The natural landscape of this place is filled amazing and beautiful wonders like waterfalls, caves, lakes and mountainous views. 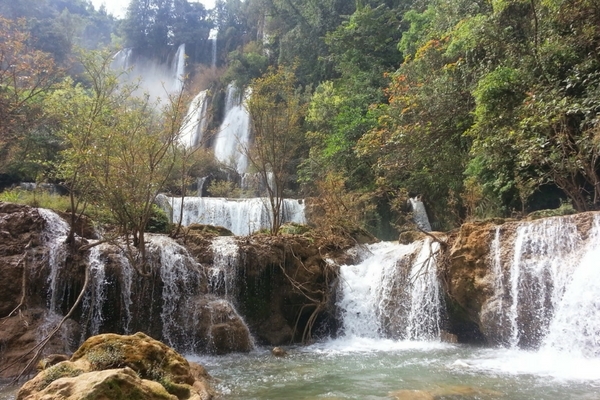 Some of the must visit waterfalls in Kanchanaburi are the Erawan Waterfalls in the Erawan National Park, the Sai Yok Noi Falls, the Sai Yok Yai Falls and the Huay Mae Khamin falls. Those who want to just spend time exploring the nearby places can also visit the city’s many art galleries, temples and museums. Situated in the North Thailand, Pai is a picturesque town located in a small valley. Pai is a romantic spot for the couples who want to spend their holiday away from the hustle bustle of major cities of Thailand. 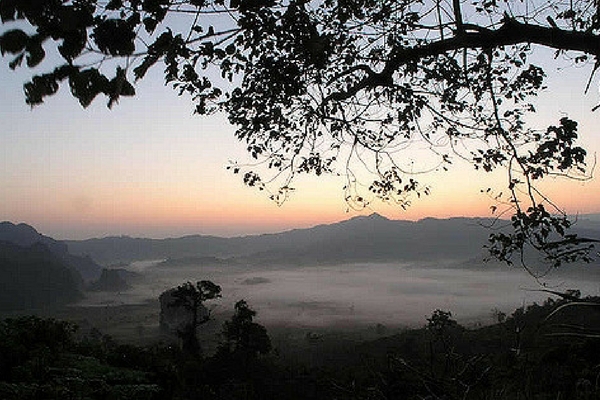 Filled with lush green fields, Pai is best explored either on feet or by motorbikes. This village has natural therapeutic natural springs, gorgeous waterfalls, traditional temples and much more to explore. For the lovelorn couples who want to spend their honeymoon at a place overlooking beautiful mountains, in nice weather and among friendly locals, Pai is the perfect place to plan for. Once upon a time, the old city of Sukhothai was the cradle of Thai kingdom. Today Sukhothai stands as a heritage city with stories about the rise of Thai kingdom hidden everywhere in the region. The amount of beauty encompassing Sukhothai makes it counted among the most amazing tourist places in Thailand. For the couples who like exploring lesser known places will fall in love with the beauty of Sukhothai. This small town is adorned with beautiful temples, captivating landscapes and a mesmerizing Yom River. Old City of Sukhothai has been declared a world heritage city by UNESCO with more than 197 ruins scattered all across the place. 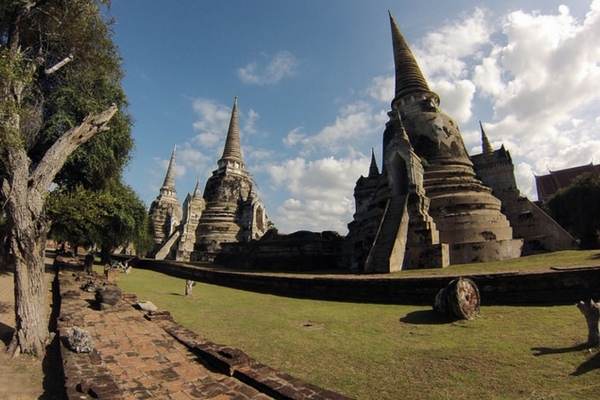 Some of the major highlights of this place are the Wat Mahathat, Wat Phra Pai Luang, Wat Sri Sawai and Wat Sri Chum. The lovelorn couples will find a lot of privacy and romantic Instagram worthy moments in the ruins of Sukhothai. This has been declared Thailand’s most romantic island by many. The couples like to visit Koh Ngai island because of its unique topography that is very different from most of the Thailand. This picturesque island has two beaches with clear turquoise waters. There are private boutique style resorts with traditional Thai Spa and Massage available across the island. 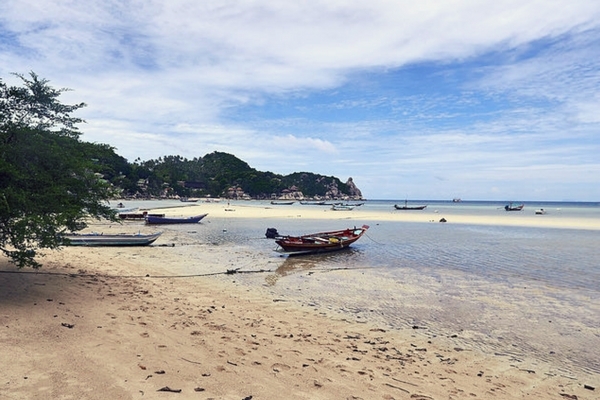 When it comes to a rejuvenating experience, Koh Ngai is perfect escapade. 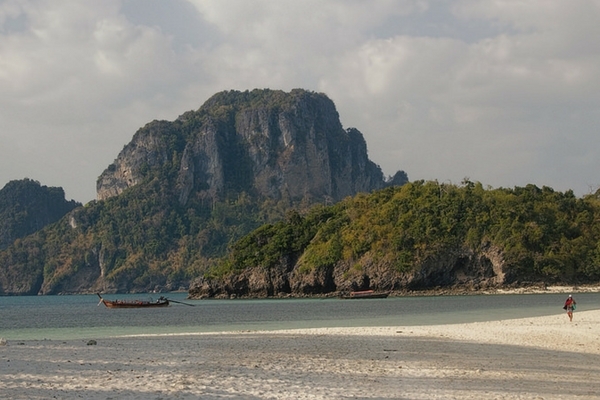 Many travel guides list Koh Ngai in their list of best places to visit in Thailand. The striking coral reefs of Koh Ngai make it a perfect snorkeling location. This quaint little island is a perfect honeymoon spot for a lovely vacation with your beloved. This private island beach resort is filled with clear sandy beaches and untouched rainforests. Koh Mun is one of the very few places that actually give you a desert like vacation experience. This island is more than a paradise where you can enjoy your privacy to the fullest. This island has 20 private villas so the chance of someone spoiling your perfect romantic moments is next to impossible. The vacation experience is elevated by the scrumptious cuisine prepared keeping the finest details in mind. A honeymoon here will surely leave a mark for a long long time. This pristine unspoilt island has a beauty that seems like it has come straight out of the paintings. The three secluded, picturesque pieces of land are perfect vacation spots among the couples who want privacy to enjoy time with each other. If you and your better half are adventurous souls then you can try the world’s first inter island zip lining. This activity will surely add extra memories in the list of your perfect honeymoon moments. Thailand is a paradise for shoppers. Every year, millions of tourists visit Thailand and stroll on the street markets so that they can return home with cheap designer clothes. The street shops in Thailand are up and running for day-and-night, seven days a week. The markets here are inspired by the road side alley markets of the West but they still haven’t lost the flavour of the cultural uniqueness of the East. When you are in Thailand, you cannot return home without spending time in these amazing streetside markets. It is the sixth biggest shopping center in the world. This huge shopping complex has eight floors only made to take any compulsive shopper to a paradise. 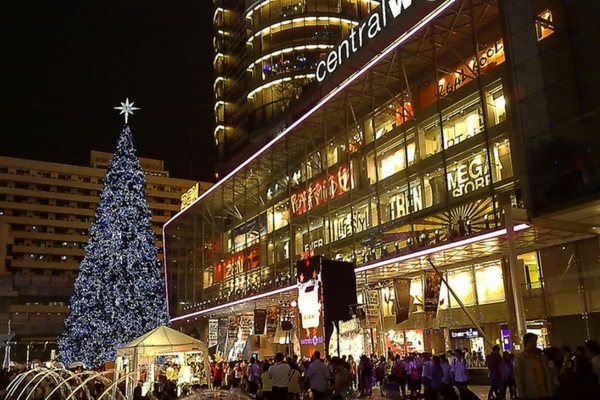 Central World is the most popular and the ultimate shopping mall in Bangkok. Divided in a number of “wings”, the building is filled with shops, cafes and restaurants. The two department stores, the Zen and Isetan, have huge open areas with a multitude of brands. For the foodies, the Gourmet Market at the 7th floor is packed with a variety of delicious food, fruits, vegetables, drinks, bakery and imported food from all over the world. 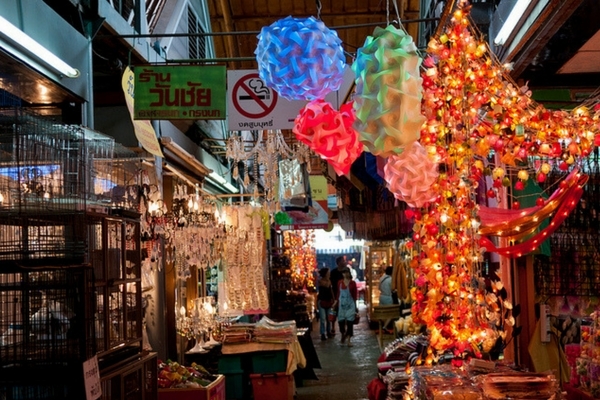 As a flea market, Chatuchak is one of the largest in the world. This weekend market spans an area of 35 acres. With 8000 stalls, this market is an unusual experience where chaos rules every nook and corner. This market has some unique sections filled with rare antiques, junk jewelries, apparels, ceramics, and souvenirs. There are multiple sections in this market that prepare amazing local cuisine. For a food lover, the choices are unlimited and you can choose delicacies like Fried chicken, noodle soup, crispy pancakes, oysters and fish cake. A local delight Thai coconut ice cream is an ultimate pleasure for those with a sweet tooth. Popularly known just as Rot Fai Market, Talad Rot Fai Srinakarin Night Market is a shopping paradise for the fans of vintage stuff. This market comes alive in the night and is frequented by those who love everything vintage and classic. You can find a lot of collectors’ items in the different sections. These items range from chandeliers, classic cars, motorbikes, cameras along with rarest of the books and music cassettes. Only in this market you’ll find a classic model of Harley Davidson along with some classic boots from the disco era. The three parts of Rot Fai are divided into ‘Market Zone’, ‘Warehouse Zone’ and ‘Rod’s Antiques’. Each of these sections has a unique aspect and an amazing section of products. Those who visit Thailand with the dream of purchasing clothes of latest fashion always head to Pratunam district for the amazing collection of designer wears. This area is filed with amazing and unique apparel shops. If you are looking for a pair of second hand boots or a leather jacket replica then this is the place where you should be. The Platinum Fashion Mall is one of the much frequented destinations with amazing offerings in terms of branded as well as street style clothing. This mall has more than 4,000 stores where latest brands are available at dirt cheap prices. Central Festival is tallest building of Pattaya Beachfront. This shopping mall is filled with 300 shops with many latest and premium brands Calvin Klein, H&M, Marks & Spencer, Nautica and Zara. The mall is also filled with some of the most amazing food outlets. The food court here serves amazing Ramens, Pasta, Oriental, Pizza, and even Indian delicacies. Central Festival also has a series of many electrical stores. The geek in you will not stop running around among the PowerBuy, Canon and Samsung outlets spread across five floors of the mall. 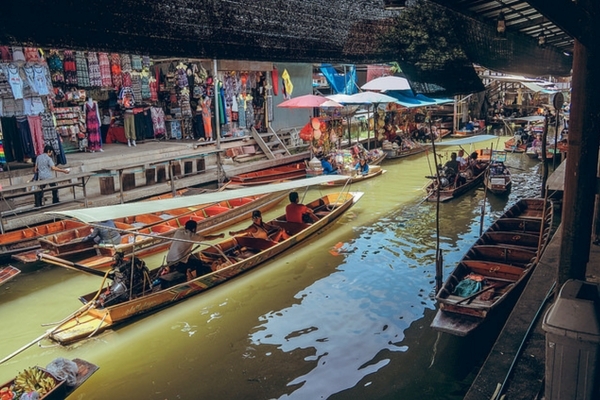 The floating market of Pattaya is a culture seeker’s paradise. Adorned with a museum, a puppet show and a shopping center, Pattaya’s floating market is frequented by photographers, shoppers and those who just want to see how local life in Thailand works. This floating market is an artificial reconstruction of the one in Bangkok. You can find local handicraft, clothing and handmade jewelry in this market. 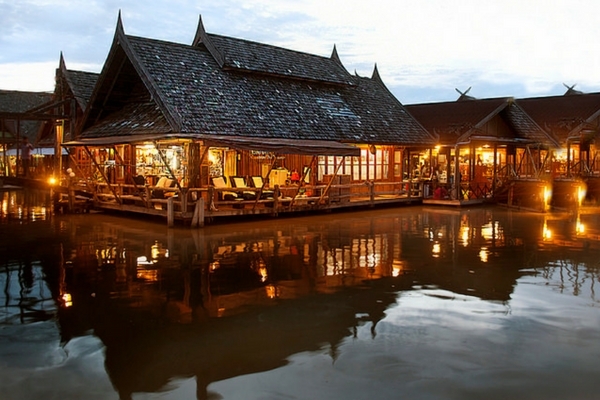 There is an array of floating eateries where one can relish upon the heavenly Thai cuisine. If you want to make sure that the souvenirs you are taking home are made by the local craftsmen and that they are not being cheated in the term of fairprice sharing then One Tambon, One product is the place you should visit. Popularly known as the OTOP shops, this market is a part of government initiative to promote and support the local artisans. You can buy a number of local made items like scented soaps, candles, slippers, clothing, ornaments, carpets and even furniture. Thailand hides many amazing and exciting secrets in its hidden jungles and mountains. You need to walk and trek a lot to enjoy these places and the beauty hidden around. Over the time, Thailand has emerged as a prominent adventure destination with activities like scuba, snorkeling, rock climbing, trekking, hot balloon ride, paragliding and base jumping available at different destinations. 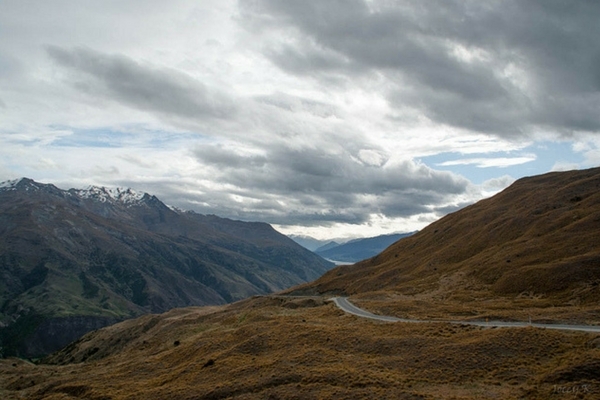 For those who love the concept of exploring new destinations will find so much to do. The Tonsai and Railay beaches have emerged as a popular destination for an offbeat adventure activity known as the deep water soloing. Tonsai is counted as one of the best places to visit in Thailand because of this unconventional sport. A professional expert or a local guide can take you through the basics of this activity. You take a tiny long tail boat and visit the 200 foot karst rocks nearby. These rocks traverse upwards out of the sea and into the sky. The first stage of this adventure includes climbing the top of the rocks with rope ladders. The guide helps you climb the rocks but once you are on the top, you’re left entirely on your own devices and skillset. The experience of the freefall from the top of the rock is something that you’ll never forget ever in your life. The sense of adrenaline gushing through your body as the you jump across the rapids of Mae Taeng is an enthralling experience. You get drenched while boating rapidly through the water while you try not to fall into the water itself as you get tossed in different directions. White Water Rafting challenges every aspect of your life and once it is over, your mind is filled with the sense of an everlasting adventure. Located in the South of Phuket, Hin Daeng and Hin Mouang are two of the best diving spots of Thailand. 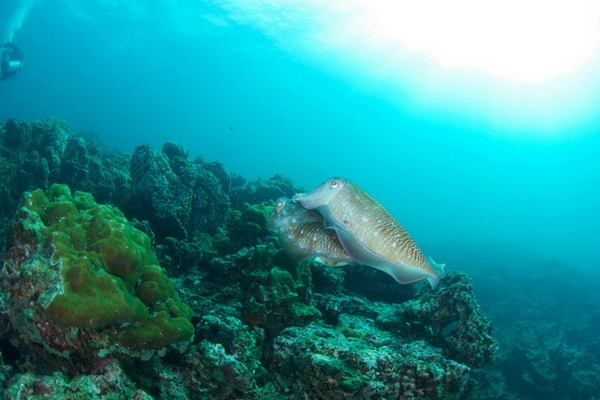 Located in the confines of Koh Lanta National Park, both places are counted among the best diving spots of the world. Diving here is an amazing experience. You get to swim through soft coral rocks as you pass by glowing illuminated school of fishes. The chances of seeing rare marine life like Manta Rays and even Whale Sharks is very high over here. 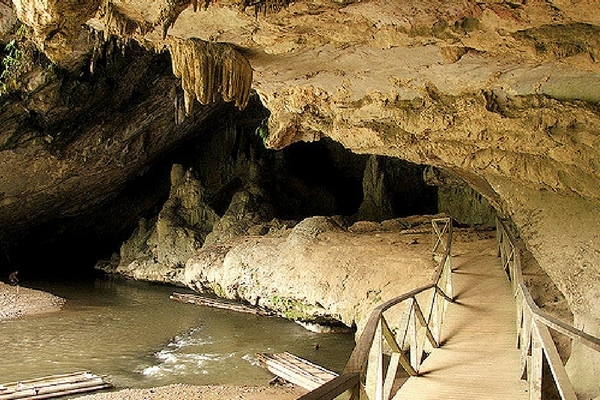 Explore the ancient caves of Thailand and get lost in the neverending maze of endless caverns. At Mapha caves you can enjoy everything that you have ever read in fantasy novels. These caves are filled with amazing underground wildlife and topography. The tour is conducted by the local guides who are experts in history and geology of the place. You’ll have a time of your life exploring the geologic labyrinths, vertical caves and collapsed caves. This unique aspect of Thai landscape is something not to be missed. Hin Bida is visited by the lovers of deep sea diving as well as those who like snorkeling. The water goes as deep as 13 meters but you can view beautiful coral reefs from a distance of three meters itself. Here you can see gorgeous coral, snapper, cuttlefish, zebra sharks, box fish, puffer fish, and even whale sharks. Koh Lanta’s island Sail Rock is a paradise of an island that is filled with cheap hostels and beautiful beaches. This island is also a destination of choice among the diving enthusiasts from all over the world. Unlike a majority of dive destinations, Sail Rock provides the cheapest diving options available in the country. Sail Rock or Hin Bai attracts the most experienced divers as well as the newbies here to witness some amazing underwater sightings. The deep dive site goes over 40 meters below the land. Because of its distance, Sail Rock has a very unique population of marine life. There is no greater fun than to exploring the Thai wilderness on a mountain bike. This activity is highly popular in the jungle and hilly planes of Thailand and there are a number of tours that offer guided and non-guided adventure programs. At M.T. Hill you can explore the region with rides that last for a few hours to the ones which last one full day. Apart from the day tours, many companies also conduct night biking tours of the wilderness. Dare to explore the unknown when the jungle comes alive, then this is where you should be. A fun adventure activity, kiteboarding is for those who like to take their adrenaline rush a little slow and don’t like to wander off from the beach. 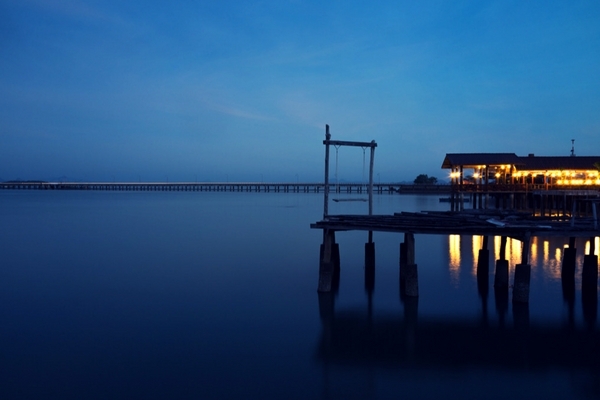 The relaxed atmosphere of Pranburi makes it one of the best places to visit in Thailand. The delight and enjoyment of Kiteboarrding at Praburi is mixed with the pleasant weather and the friendly waves you get to ride along. Also known as Wat Chaeng,Wat Arun is situated on the west bank of the Chao Phraya River. 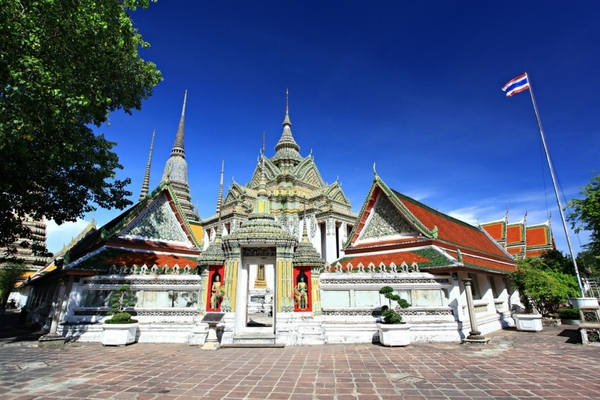 This is one of the most picturesque temple complex located in Bangkok. It has a beautiful riverside location that creates the pleasant sceneries of sunset and sunrise. The colourful decorated spires add the charm to its design. This great piece of architecture stands majestically over the water. 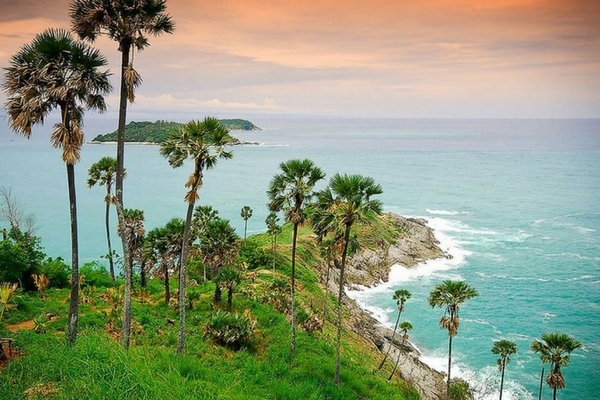 Promthep Cape offers breathtaking views over Andaman Sea. 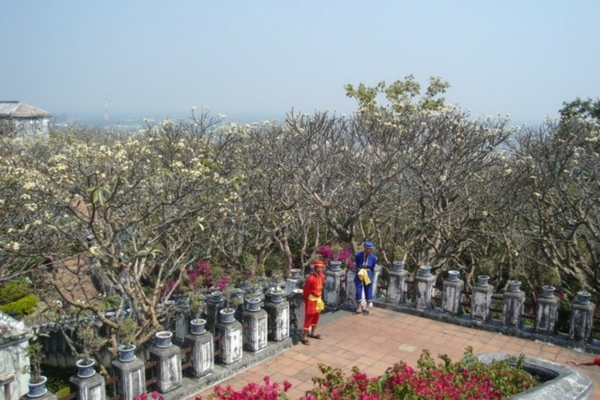 Photographers visit this place to enjoy the encompassing views from the top of the hill. The views of sunset and sunrise from the top are breathtaking. The lush greenery surrounding the Windmill Hill also makes it a popular hike among the couples who like to come here with their picnic spreads. 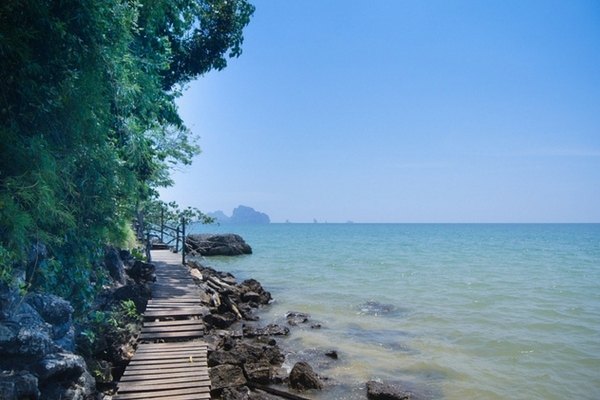 The beautiful beaches of Railay are loved by tourists who come here to enjoy the natural beauty. The lovely white sandy beaches are perfect for those who want to relax and enjoy the refreshing atmosphere. 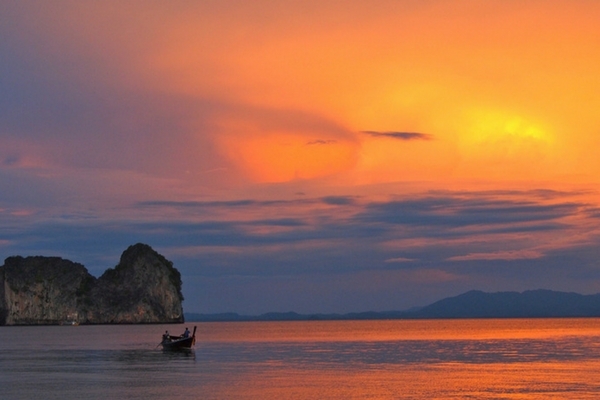 Railay is one of the few places that compel people to wake up early and stay up on the beach till the night. The Railay East beach provides amazing views of Sunset while the west beach is for those who like to enjoy sunset and later the beautiful stars in the night. Apart from the sandy beaches and crystal clear water of Andaman Sea, Thailand is also surrounded by some beautiful mountains. 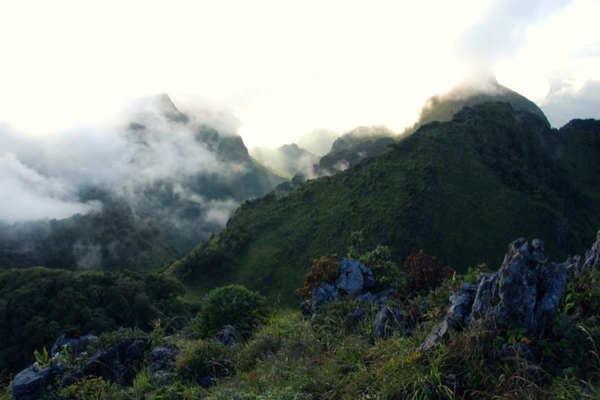 The amazing hills of Thailand make this country a perfect trekking destination. Its serene, lush green pristine rainforests and the high mist-enveloped mountains are perfect landscapes to go on a day hike or even choose from many multi day treks. Filled with wilderness and scenic landscapes, Mae Tang is the base camp for those who come to explore the mountainous routes of Chiang Mai. The culture lovers will also get to meet some of the thriving populations of hill tribe villages. The Doi Inthanon is the highest mountain of Thailand and is a challenging trek only to be taken by the experts. A lot of people like to document the life of hill tribe villages in Thailand. There are a number of guides and professional hiking companies who provide special hiking activities to these villages. During these trekking trips you’ll get to meet the people from the Karen, Akha, Lahu and Padaung tribes. These people have made these mountains their home and are known for their indigenous ways of living. Padung Tribes is the famous community of women who sport long necks with the help of brass rings. The treks of Umphang region are popular because of the lovely landscapes and natural wonders spread across the trail. 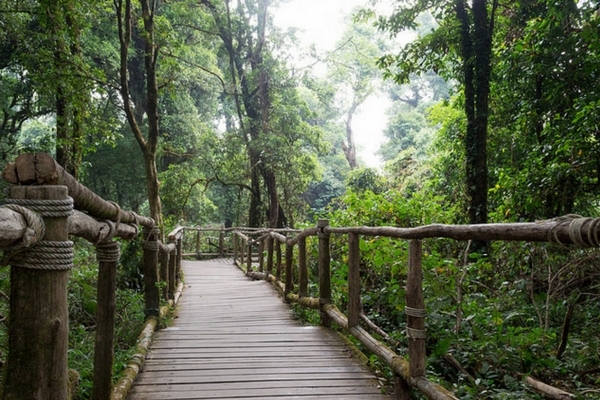 One of the best treks here is the hike through the Umphang Wildlife Sanctuary. This trail will take you through some of the encompassing waterfalls and you’ll finally see the 200m-high Tee Lor Su Waterfall (Nam Tok Thilawsu). This gushing waterfall is flowing all year long and the sheer greenery around the region will make you fall in love. This paradise adorns the natural beauty in every corner. This picturesque location sits by a quaint riverside and is surrounded by forested hills and paddy-filled valleys. The lush green valley brings many landscape photographers who come here to capture dramatic skies and birds chirping around. Its location is closer to the Burmese border and many unexplored places. The three treks organized by local companies will take you through many hidden wonders alongside the border of Myanmar. This idyllic valley is nestled around a corner of a mountain from where one can enjoy the breathtaking views of the valley. Popularly known as Thailand’s valley of flowers, Phu Lang Ka has several hiking trails as well as multi day trekking locations that take you across multiple waterfalls, hidden temples and serveral limestone karsts. For the photographers, there are huge chances of capturing some colourful birds, vibrant flowers and endless lush green valley in the canmera. 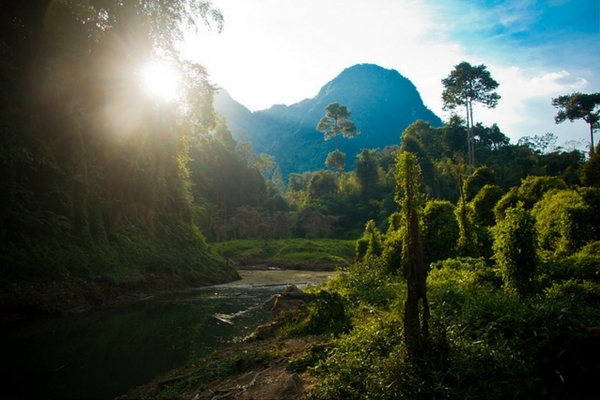 Phu Lang Ka is bestowed with natural beauty unmatched to any other place. Thailand’s wildlife is often overlooked in front of pristine beaches and crystal clear waters of the Andaman Sea. But the wildlife of Thailand is as stunning as the beaches are. Thailand has some stunning National Parks filled with a diverse range of flora and fauna. Parched with rugged limestone cliffs towers spread around over the man-made Cheow Larn Lake of Khao Sok National Park. This wildlife sanctuary covers a huge part of Southern Thailand. It attracts a lot of wildlife lovers as it is in the proximity of the popular tourist spots of Phuket and Khao Lak. A trek through the dense jungle is the best way to sight some of the unique animal population along with reptiles and insects here. Sighting of Tapir, Malayan sun bears, clouded leopards, pangolin, vampire bats and gibbons is common here. Apart from the animals and birds, the dense jungles of this national park also have an impressive collection of plants and flowers. The fauna here includes the extremely rare Bua Phut – a parasitic plant that takes nine months to grow its only flower to a gigantic 80 cm in diameter. Iconically,it is one of the 51 islands that belong to the Tarutao National Marine Park archipelago in southern Thailand. The island is popular among the adventurists, wildlife enthusiasts and casual tourists. Cheap stays and a relaxed vibe of the place make it a perfect place to spend your vacation. The rugged mountain and encompassing jungle is filled with the famous limestone cliffs. Exploration trips regularly take visitors through well marked trails where they have a good chance of catching a glimpse at some exotic wildlife. The western beach is filled is popular for the sightings of large turtles. 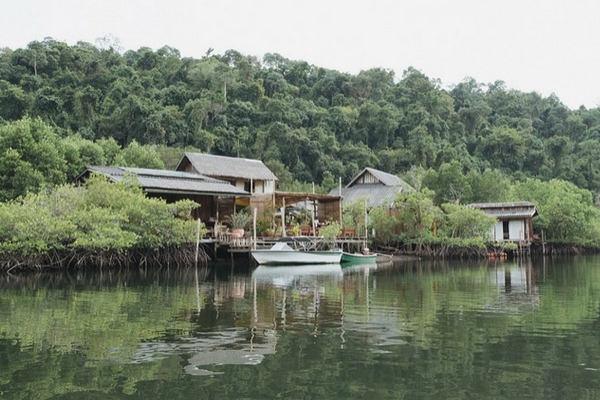 Thailand’s oldest rainforest is just 4 hours away from Bangkok. 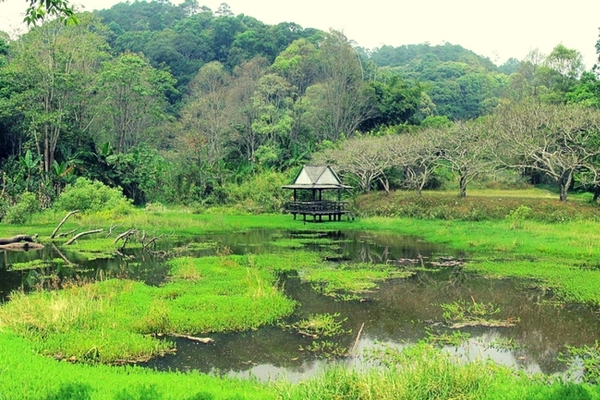 Khao Yai is the best place in Thailand to go on a well guided and crafted wildlife tour. The chance of spotting the unique fauna and avifauna is at the best here. This trip introduces you with wild elephants, tigers, bears, porcupines, gibbons, snakes and parrots. One of the popular trips here is the sunset visit to the ghostlike bat caves. As the sun goes down, millions of bats fly into the dusk. Another trail will take you to the waterfall where Leonardo DiCaprio dove into during a scene in his movie The Beach. It is filled with tiny tropical islands. This bay is also famous for amazing underwater coral making it a popular destination for diving enthusiasts.. The limestone formations are filled with Bengal monitors, flying lizards, water snakes and different types of vipers. The mangrove forest of Phang Nga is filled with more than 200 species of birds, reptiles and snakes. The islands are less frequented by the tourists so it makes a popular destination for the honeymooning couples looking for some time amongst each other. It is the dream destination of every wildlife photographer. This animal sanctuary is located in the Tenasserim Hills in the Prachuap Khiri Khan province. Kui Buri is known as the best elephant and gaur sighting in destination Thailand. Wildlife researches, enthusiasts and photographers come here from different corners of the world and stay here for days studying the behavioral patterns of the animals here. This park is the home to a variety of animals including elephants, sambar deer, water buffaloes and monkeys. You can also visit the Wildlife Friends Foundation to learn about the local rescued wildlife, from primates to tropical birds. The highest mountain in Thailand, rises 2,565 meters above sea level and forms a large area of Doi Inthanon National Park. This wildlife reserve is one of the most diverse forests in the world. Filled with a mixture of lush rain, mixed, and pine forests, Doi Inthanon is filed with waterfalls, hiking trails, and two chedis. Doi Inthanon is one of the popular spots for the birdwatchers who come here to capture beautiful, colourful birds in their camera. There is one reason because of which visitors flood to Thailand is has to be so many beaches spread across the country. From the popular touristy beaches to the offbeat beach resorts on different islands, one can experience it all when visiting Thailand. The gorgeous beach town of Krabi once used to be a hotspot for the backpacking community who visited this place because of cheap hostels and reasonable prices of food. Today, Ao Nang is slowly becoming one of the thriving destinations of Thailand. The gorgeous beach, local food and cheap stays have made Ao Nang a desirable place to visit and spend some days. The tourists and couples who wish to escape the crowd of mainstream Krabi beaches find their solitude in this budget friendly beach town. The tiny beach town of Koh Kradan is located on the south of the popular destination Koh Lanta. This part beach resort, part national park creates a lovely amalgamation of the best of two landscapes. Koh Kradan is famous because of several limestone pillars rising from the sea that gives gorgeous views during the sunset. It is the fourth biggest island of Thailand but is not frequented by tourists or locals. Koh Kood’s coastline is rocky and uneven creating a unique topography. Kluai Beach is the most popular beach of Koh Kood, and by most popular we mean that you’ll find a bunch of people scattered in the 2 km stretch of the entire beach. Kluai’s ambience is scenic and is dotted with mangroves. 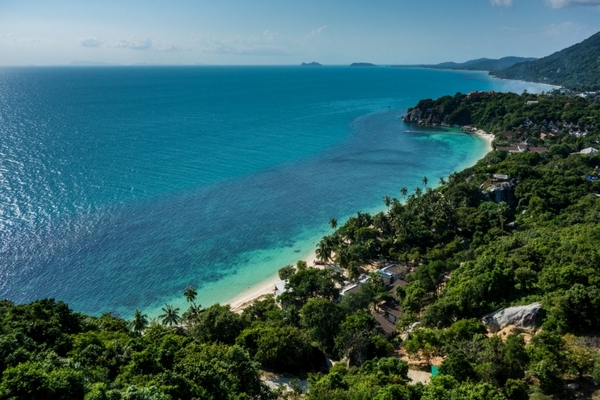 A tranquil beach destination in the Koh Samui province, Mae Nam attracts honeymooners who want to spend their time at a place without loud music and bustling traffic. This narrow beach is filled with palm groves, this 5 kilometer long stretch is perfect to for lovelorn couples who wish to find an ideal spot looking for a hideout. Dongtan is located in Pattaya and is one of the most popular gay friendly beach destinations of the country. This beach destination attracts the gay tourists as well as travelers looking for a different cultural experience. The diverse crowd of the beach is sprawling with people in colorful costumes at many different pubs and shacks spread around the place. One can also find the best massage parlours, cafes, hostels, fruit sellers, seafood vendors, etc. spread in whole area. This gorgeous beach of Phuket is a favorite destination for the luxury seeking travelers. Being filled with some of the most luxurious resorts and hotels make it sprawling with high end restaurants and pubs. Karon Beach or Hat Karon is also known for its sprawling nightlife and is perfect for those who want a more personal experience and tend to avoid the popular party venues. Apart from pristine beaches, islands, jungles and other wonders, Thailand has a lot more to experience. Those who are looking for something different or want an offbeat experience during their trip also have lot to do. The UNESCO World Heritage Monuments of Ayutthaya National Park displays the ruins of one of the largest ancient cities in the world. This national park displays brilliant examples of Thai art and is a wonderful place to explore for anyone who loves culture and heritage. Some of the important attractions in the Ayutthaya Historical Park include Wat Ratchaburana, Wat Phra Sri Sanphet, Wat Mahathat, Wiharn Phra Mongkhon Bopit and Wat Phra Ram. The famous Wat Mahathat which showcases the head of Buddha emerging from the branches of a tree is also located here. 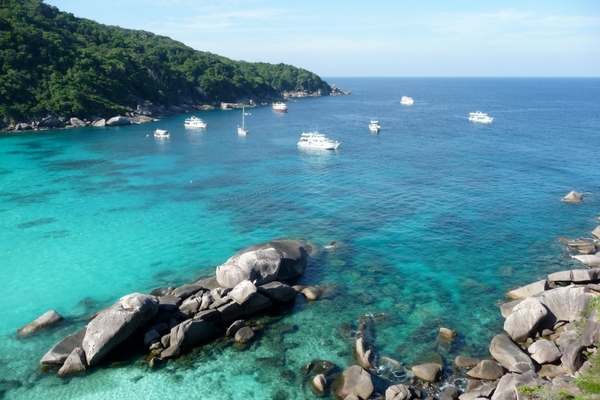 Similan Islands is an example of geological brilliance. This group of nine gorgeous islands is counted among the best tourist places in Thailand. These islands have a unique geological importance as they are formed by hot magma. Sprawling with colourful fishes swimming in the turquoise waters makes this place extremely picturesque. Located in a corner of Phang Nga Province in southern Thailand, Similan Islands are visited by tourists who come here to partake in activities like diving, snorkeling and island cruising. Located in Isaan region of Thailand, Phanom Rung is located amidst the rim of a dormant volcano. The temples of Phanom Rung are the most significant and magnificent Khmer temples included in places to visit in Thailand. The architecture of this temple is known for its amazing designs and carvings on the walls and ceiling. The annual festival here brings travellers looking to experience the local culture and traditions of this country. The hustling bustling atmosphere of Damnoen Saduak Floating Market is a gorgeous place for those who want to experience Thailand’s local lifestyle. 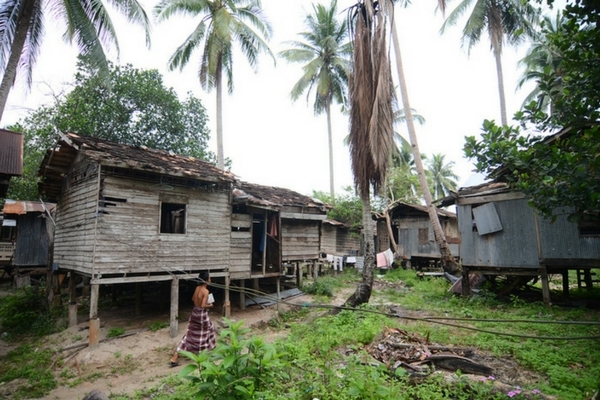 This vibrant piece of Thailand’s rural lifestyle is located in a sea of chaos and confusion. It is widely visited by photographers and travelers who want to document its colourful ambience. This market runs in the morning between 7am to 9am and one can find delicious street food, traditional clothes and handmade ornaments, and a lot more in corners of this beautiful market. Located in North East Thailand, The Red Lotus Sea captures the beauty of a tropical flower garden and mixes with the tranquil atmosphere of a lake. 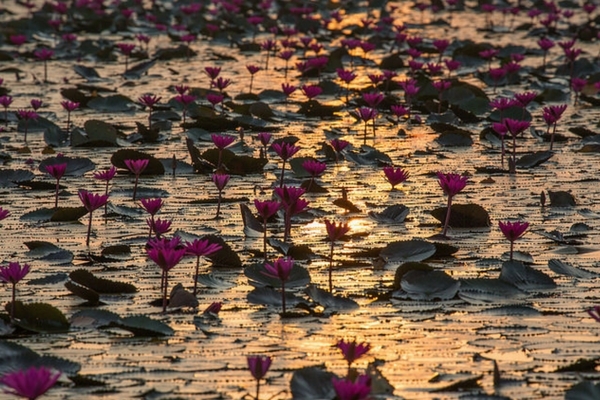 Locally known as Talay Bua Daeng, This spectacular region is filled with millions of lotus flowers. Being filled with red colour flowers is the reason why it is called the Red Lotus Sea in the popular language. Loei is an unexplored region of the North East Thailand and is known for its annual ghost festival. This place gives you a cultural experience of Thailand as it is filled with tribal populace. Backed by Mekong River, Loei is has many wooden stilt houses. The early morning fresh market is very popular here. You can enjoy fresh strong coffee and even rats if you want a unique culinary experience during your Thailand visit. 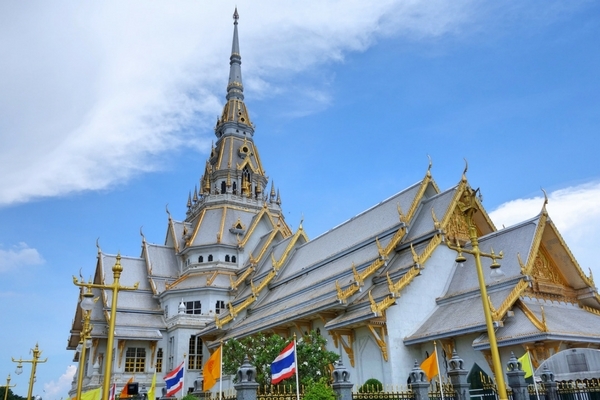 Filled with a plethora of shrines and pagodas, what makes Khon Kaen worth visiting it the Phra Mahathat Kaen Nakhon Temple. This temple is popular as its gold covered exteriors. A unique part of this temple is that they incorporate modern pop culture themes like Star Wars and Mickey Mouse characters into the Buddhist teachings. 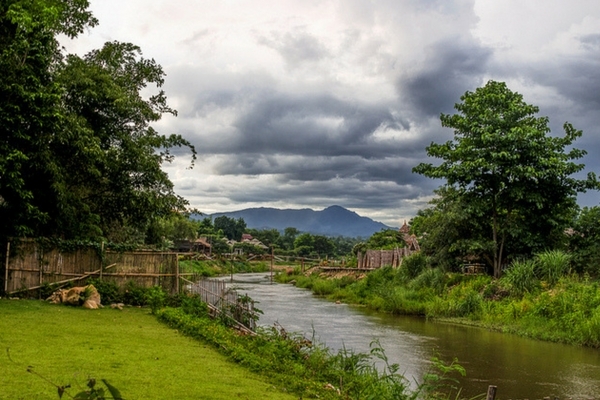 Located in the Loei Province of Thailand, Chiang Khan has a chilled out and relaxed vibe. 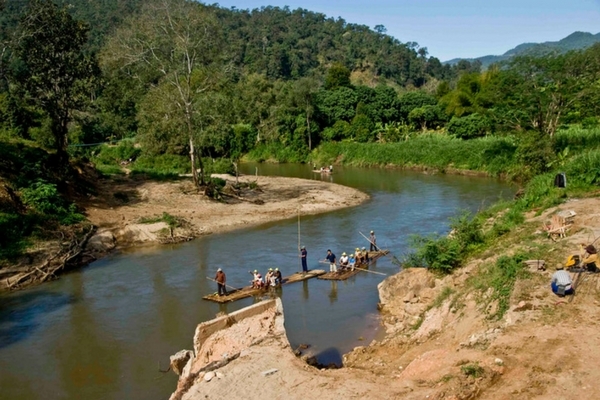 At Chiang Khan, beautiful countryside and pristine Mekong River makes you feel that the time decided to take pause. The best way to explore Chiang Khan is by taking a cruise across the Mekong River. A drive up to the top of Phu Tok Mountain is also a nice idea to enjoy stunning panoramic views of the entire region. Located in the Gulf of Thailand, between Koh Samui and the mainland, this trip takes you through some of the gorgeous islands of the country. This trip is the best way to get introduced with the amazing marine life of Thailand. Ang Thong National Marine Park is a picturesque water habitat that spans in a huge area of more than 90 square miles. The tropical evergreen forests of the island are home to beautiful oriental pied hornbills, little herons, monkeys, and bats. The water is filled with beautiful sea creatures like dolphins, whales and multiple species of sharks. The beautiful province of Chachoengsao houses some of the oldest temples of Thailand. Wat Sothorn is a vibrant pale coloured temple is located next to a river on which the main idol of Buddha was discovered. Being a lesser known temple on tourist map, this temple is also an amazing place to find the local crowd. People come here to offer small pieces of gold leaf in the honor of the deity. 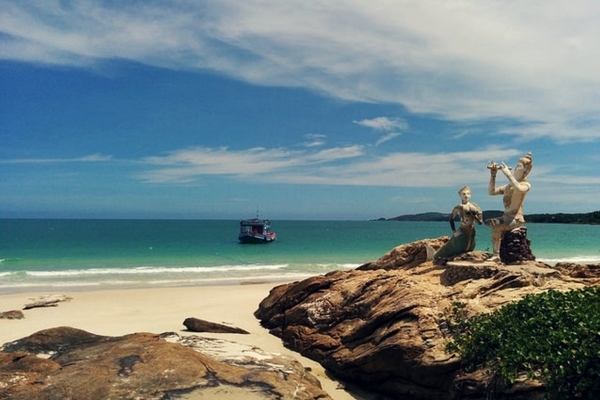 Located in the Eastern Thailand, Koh Samet is only 200 km away from Bangkok. Among places to visit in Thailand, many travelers opt for Koh Samet during their Thailand Holidays because of it being more peaceful compared to hustling bustling Bangkok. 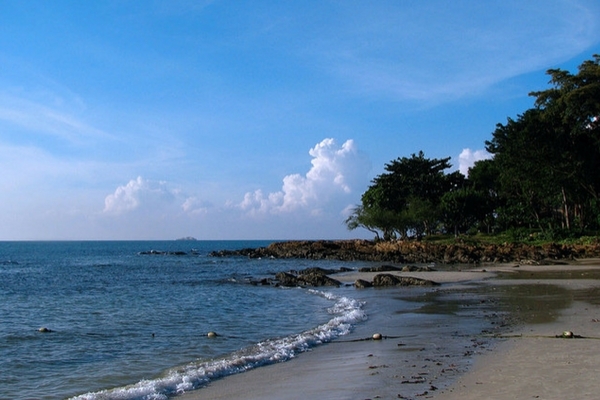 Koh Samet is a gorgeous area with 16 beaches. Some of these beaches are more secluded compared to others and have some amazing resorts offering privacy and peace to their visitors. The bustling nightlife, delicious cuisine and fun watersports make Koh Samet the perfect place for everyone visiting Thailand. Wat Pho Sila or locally called Pho Sila Templa is located in Ban Pueai Hua Dong, Tambon Pueai. Pho Sila Temple is visited by the history and culture enthusiasts who come here to see antique, big white sandstone Sema leaves from Dvaravati period. The origin of these leaves is said to be more than 1,000 old. Also known as Wat Chanthraram, this temple complex is filled with trees where bats rest in the afternoon. The perfect time to visit Bat Temple is evening when they fly off. Located in Ang Thong province of Thailand, Bat Temple has a nice and serene atmosphere. This beautiful temple complex in the province of Chachoengsao houses one of the largest statues of the Hindu God Ganesha placed in the resting position. The wall exteriors of this 22 metres wide and 16 metres high statue also have some beautiful paintings of Lord Ganesha in different postures. This temple is located next to a river and has some lovely statues like a rainbow coloured Naga, a multi-headed snake. You can also see idols of fearsome dragons along with a glorious statue of Kuan Yin, the Goddess of Mercy, who has a high rank among the followers of Taoism and Buddhism in East Asia. This beautiful Thai village is a beautiful exhibit of a traditional hill tribe home. The home stays here present you with an authentic taste of the local life. You can also dress up in ethnic Thai costume and get your photos clicked. You can also purchase hand-woven textiles, handmade jewellery, tea and other artisan products. Phu Chi Fah in Thai language means mountain pointing to the sky. This mountain is almost 4 hours away from Chiang Rai and is perfect to witness sunset or sunrise from the top of the mountain. The trail is easy and is located at a distance of 1.8 km from the base. 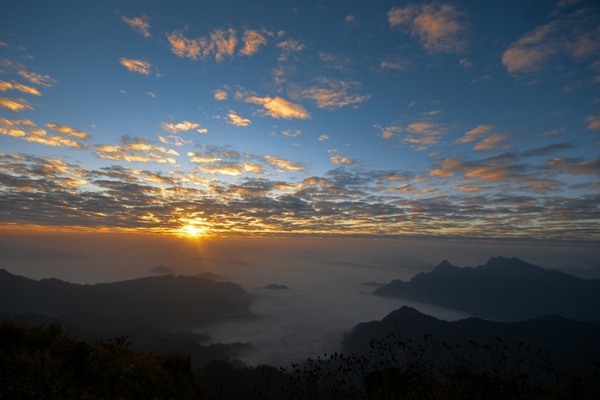 The top of the mountain provides beautiful views of Mekong River and the border of Laos. This traditional old town of Thailand has beautiful homes influenced by French style of architecture. Located on a quaint riverside, this pristine little town of Chanthaburi Province will present you with untouched lifestyle of Thailand which lives in an area filled with dazzling temples and churches. You can also find some amazing local food, bakeries and cafes spread in different corners of the Old Town. Kamphaeng Phet Historical Park is a fascinating archaeological site filled with ancient temples and ruins. This historical park was listed as one of the World Heritage Sites by UNESCO. This park is filled with many temples and statues, the most notable ones being Wat Phra Kaeo, Wat Phra That and Wat Singh. The Hellfire Pass Memorial museum withholds the gruesome records of the atrocities done by the Japanese Army on several prisoners of Allied forces to build a railway line till Burma. The railway line is known as Death Railway and one can still take a ride on the train passing through sugarcane fields and rice terraces. You can offer your respects to the fallen prisoners who died while working on the railway track. 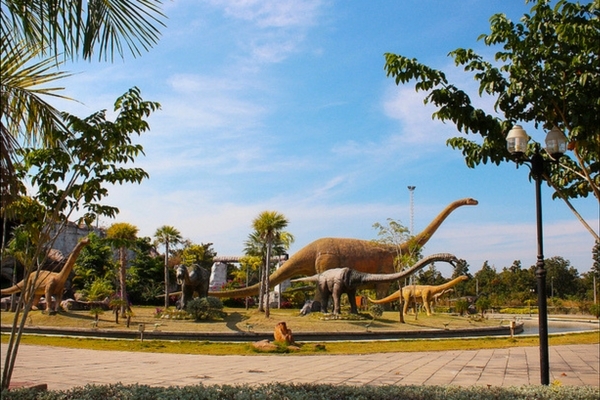 Khon Kaen has several prehistoric records of dinosaurs walking in this region. The Phu Wiang National Park has several such excavation sites where the remains of these mighty creatures are recorded to be more than 100 million year old. This park spans across an area of 300 square kilometres. You can find small waterfalls like Tat Fa and Tat Klang, a reclining Buddha image carved into a mountainside along with many dinosaur footprints in the locality. 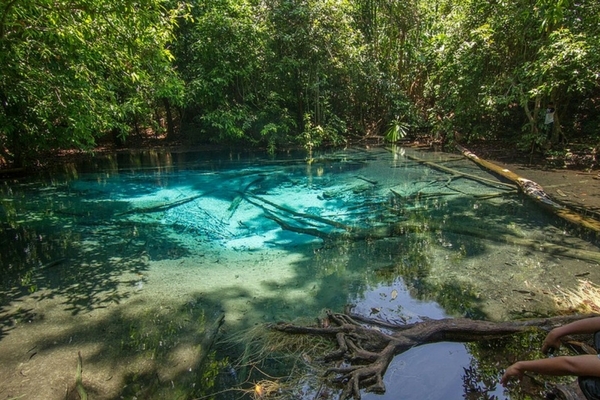 These hot springs are located in Krabi province. Located in an area surrounded by tranquil jungles, the hot springs are created over the remains of an ancient volcano. A visit to these springs is the best way to unwind after a holiday filled with party and adventure. Also known as Tub Island and Koh Tap, this island is not frequented by many tourists. One can reach this island via longtail boats from Ao Nang. During the low tide season, a sandbar connecting this island to the nearby island emerges. It is an amazing experience to walk on this small path. This small province of Thailand is known for the historical remains and temples spread all around the city. Those who want to explore rural and authentic Thailand need to visit Lamphun because of its quaint vibes. 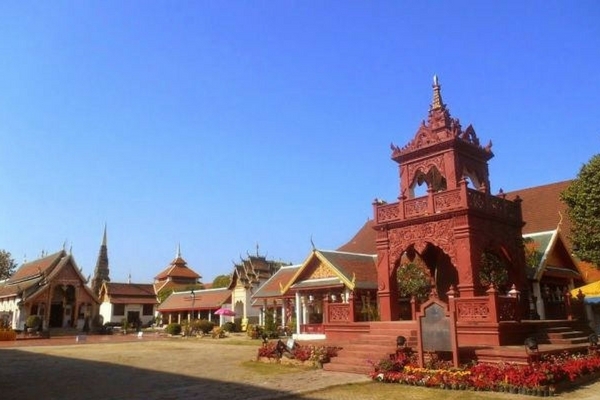 You can visit Wat Cham Devi, the burial place of Queen Chama Devi. This glorious temple complex consists of 60 Buddha statues. Located alongside the Mukdahan’s riverfront, the four small but really gorgeous temples stand facing the Mekong River. These temples contain some beautifully designed Buddha images, chedis and shrines. The four main temples consist of Wat Si Mongkhon Tai which was constructed in the year 1700, Wat Yot Kaew Siwichai, Wat Si Sumang Wanaram and Wat Si Bun Rueang. Together these temples can be explored along with Indochine Market making the perfect stretch to take a stroll in the evening. Tis is visited by many adventure enthusiasts who come here to enjoy the thrill of Sky Diving. Nong Kho is considered as one of the safest sky diving spots in the world. This 20 minute thrilling free fall experience takes you as high as 12,500 feet. From this height, you jump and fall by the speed of 120 mph. This adventure is an experience to remember. Unlike most of the Thailand, Pattani’s culture and heritage is influenced by the rule of Malay Kings who introduced Islam in this region. Today Pattani boasts of beautiful mosques and shrines. The heritage of Pattani makes it one of the best places to visit in Thailand among the history lovers. Some of the important mosques are Matsayit Klang, also known as Pattani Central Mosque. This mosque is the largest in Thailand and the architecture is influenced from Taj Mahal. Krue Se is another mosque, constructed in Middle Eastern style. The ancient port town of Yarang is known for its glorious history and a kingdom that spanned will Malaysia. Yarag had a long trading history between neighboring countries of India, Malay and Burma. Today, the remains of this ancient town are present in the ruins in three important sites, Ban Wat, Ban Chalae and Ban Prawae. 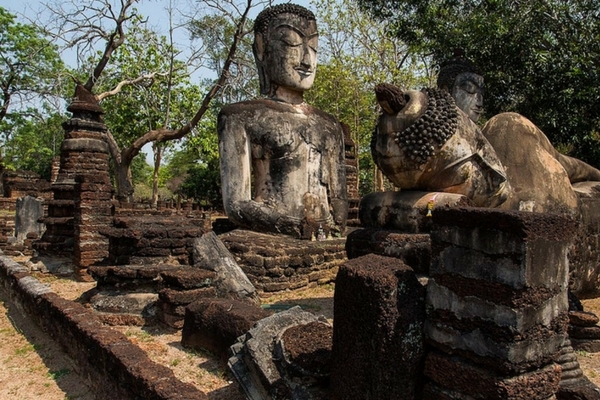 If you are an art admirer or history buff then you should not miss visiting the ruins of Yarang during your trip to Thailand. James Bond Island earned its named after serving as a shoot location for the James Bond movie ‘The man with the Golden gun’. The island’s landscape is known for its iconic tall vertical rocky formation standing in the middle of the bay of KohKhao Ping Kan. Regular boats and cruise services take the tourists for a day trip to this island. 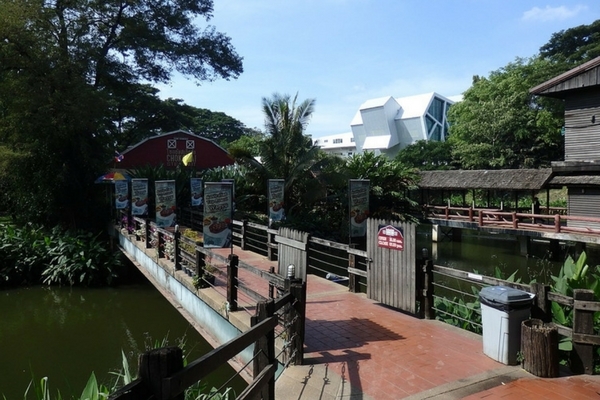 Located in the wilds of Kannayao, an hour drive away from Bangkok, Siam Park City is a marvelous amusement park.. With more than 40 rides designed for both children and adults, Siam Park City offers something for the visitors of every age and gives them a chance to spend a fun filled day. The theme park boasts of some mind-blowing extreme rides like five loop Vortex and Boomerang roller coaster,. The waterpark here has the world largest wave pool. The adventurous ones can also slide down from some cool water slides. Khao Wang is an ancient palace that is now the home of Buddhist Monks who stay here and pray. This palace was constructed by the King Rama V with the purpose of welcoming the Portuguese envoys. It was converted into a monastery in 1925. Khao Wang Palace is known for its beautiful décor and architecture. Anyone who is keen on witnessing the Buddhist Way of life needs to visit Khao Wang for an incredible experience. The beautiful caves of Khao Ngoo welcome you with a newly created statue of walking Buddha covered in gold. The cave region is filled with several monkeys who will entertain you with their antics. The main attractions of the caves are the Buddhist murals and paintings. A flight of 446 steps takes you to a point from where one can enjoy stunning views of the city. This small hamlet in the province of Raylong presents you with an authentic introduction to Thai lifestyle. Home to a fishing community, Ban Kon Ao attracts many photographers, writers and culture seekers to this paradise who want to enjoy the local life in quaint and serene surroundings. 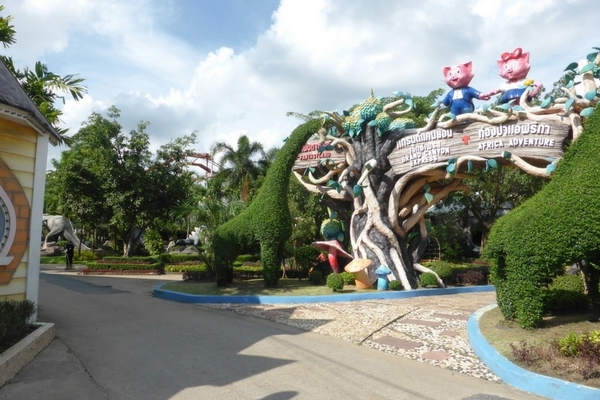 Situated in Roi Et township, Phalanchai Park, is considered as an important part of the Thai Heritage. This park features an island in the middle of a lake with an approximate area of 200,000 square meters. The City Pillar Shrine is highly revered by the locals. A statue of Walking Buddha is located in the middle of the park with several colourful flowers surrounding the place. This lesser known destination of Thailand is rich in natural beauty. Nakhon Ratchasima is known for its practices of agro tourism and the followers of Khmer culture. 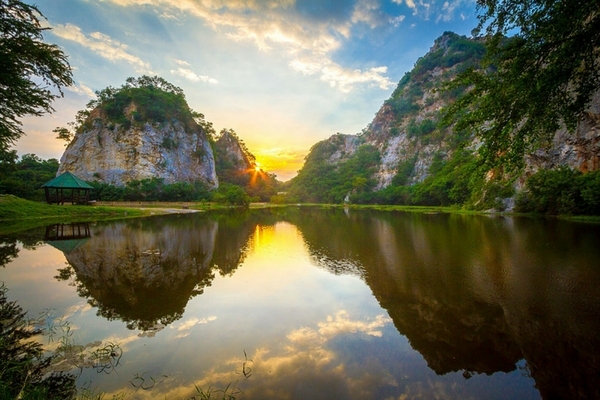 Along with 112 mammal species and 320 species of birds, Nakhon Ratchasima is filled with natural beauty, incredible hiking spots and some tranquil waterfalls. Visiting Thailand is like going to a giant amusement park which has something for the visitor of every age. With this list, you’ll be able to make the best out of your Thailand holidays. When you are planning your Thailand trip, go through this guide and select the places carefully. If there is a confusion, then let our experts know and you’ll find the perfect assistance.